Since completing my studies I have been working as a subcontractor for ecology companies where I carry out bat surveys including dawn re-entry surveys, dusk emergence surveys, and bat activity surveys. Through these surveys I identify the bat species through their calls within the survey site and record their location to assist in the assessment of ecological impacts of developments on bats. Alongside this, I have continued training for my great crested newt level 1 class licence which has been recently approved. In my career I have done many exciting and fun things, from assisting in the translocation of a large population of great crested newts to surveying and recording reptiles and bats. However, the most exciting thing that I have done in my career is to survey a lesser horseshoe bat roost. There was a large colony and I was tasked with counting the individuals which emerged and re-entered the roost. This was one of the best things I have done as lesser horseshoe bats have a beautiful warbling call, which I got to hear all through the survey, but I also had them flying as close as 30 centimetres from me which was a wonderful experience. If I could have done things differently since graduating I would have made more use of the University’s careers and employability service to enhance my CV and get advice regarding careers and employability. I would also have researched local ecology companies and sent out more emails to companies within the ecology sector to register my interest in any current or future job roles or subcontractor work. If I were to start university again I would have chosen a three-year undergraduate degree instead of the foundation degree with a partner college and then topping it up, as I feel this would have made my third year easier. I would also ensure that I give myself a good grounding in the following semester’s modules over the summer, to get to grips with the module's concepts quicker. One of my main reasons was that the University of Plymouth's top-up degree was a natural progression from my FdSc Animal Science degree. The University of Plymouth was my top choice as it had a better choice of modules for the career I was striving to achieve and it also had a selection of modules which really interested me. Plymouth also provided a module on advanced skills and concepts which would give you practical skills on your chosen topic. For me, this was of particular interest as one of the topics covered was bat ecology and survey techniques, which I knew would greatly enhance my career prospects. The University of Plymouth supported my studies by providing access to a wide range of journals and books online and in the library. The library staff were always helpful, finding what you needed or helping with the use of equipment. Before starting university I didn’t know exactly which biology based career path I wanted to head towards. 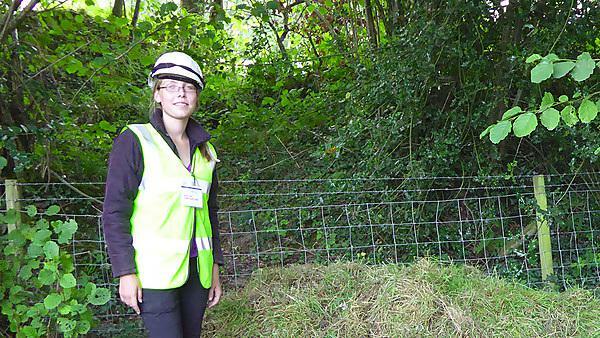 Studying at the University of Plymouth helped me to firmly set my career aspirations towards ecology by giving me a better theoretical and practical understanding of many ecology and conservation practices. My favourite memory of studying at the University of Plymouth was definitely the topics covered on the advanced skills and concepts module. My favourite memory is from studying bat ecology and survey techniques, where we were taken to roosts of lesser horseshoe bats, pipistrelle bats, and long-eared bats and watched them emerge whilst using bat detectors to listen to their calls. This gave me valuable skills and practical experience but it also helped in creating better friendships through group work. Studying at Plymouth helped to make me a more independent person and adaptable to any task I may need to perform. This, coupled with valuable ecological survey skills, communication skills, and knowledge learned from the degree, ensures that I am in a favourable position when standing for future job roles. Why would you recommend undertaking a course with the University of Plymouth? I would recommend the University of Plymouth because of the number of resources available and the staff, who are helpful and do their best to assist your education. The BSc (Hons) Animal Conservation Science course is broad but detailed and prepares you for a variety of careers. For more information about Animal Conservation Science, please visit the BSc (Hons) Animal Conservation Science course page. For more information about our range of courses within the School of Biological and Marine Sciences, please visit the school page. If you would like to find out what other alumni are currently doing, please visit the biological, health, chemical and agricultural sciences interest area.